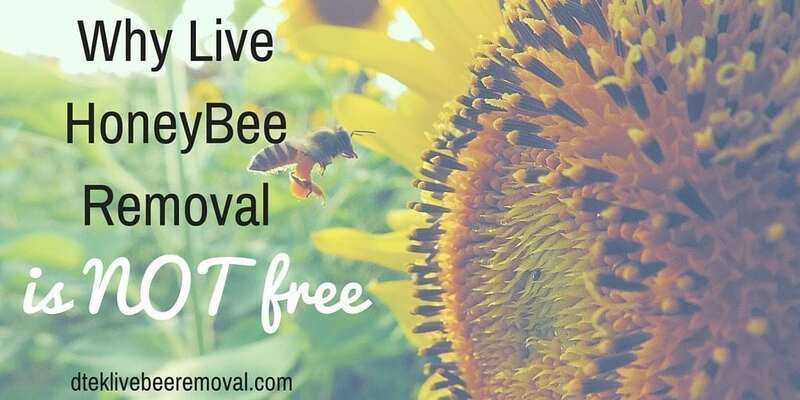 I get a lot of calls from people thinking that our live beehive removal service is free. At first it seemed like a joke. But then it kept on happening. Again. And again. Here is what happens when we get a call to remove a bee-hive from a home. We get in the car and drive there. And then we have to carefully remove the bee-containing hive and make sure we don’t disturb it on our drive to deliver them safely to local bee farmers. And of course we have to drive back home. I wish I could buy gas with a queen bee or pay my medical bills with a pot of honey but the last time I checked, the legal tender of the US was still the dollar. I know. BUMMER. Let’s get a bit of education shall we ? 1)Honey Bees Are Not Going Extinct. While the number of honey bees in the US has declined in recent times, they are VERY FAR from going extinct. This drop of honey bee number has happened for a few reasons. A major reason behind their decline in recent times is due to the use of pesticides on plants leading to a condition called “colony collapse”. A simple removal of harmful pesticides on plants could eliminate this decline as has been demonstrated in places like Australia. A “decline” however is completely different from “extinction”. A lot of the hype the media has put behind this “bee apocalypse” is the fact that without honey bees plants we use for food will not be pollinated. Thus our food supply would diminish and leave us in a travesty. I am very much an advocate for the environment and keeping species in their natural habitat so they can do their thing. Honey bees are only ONE of a few thousand species of insects that pollinate (spread powdery pollen from one flower to another to allow food plants to develop) plants. Couple that with the fact that bees are NOT going extinct and you have a case of the media once again causing a panic where one does not exist. Should we be concerned about colony collapse and declining numbers of bees ? Absolutely ! No one living species should be allowed to decline to the critical “no return” point. In the same vein however, it is important that we get the facts straight and not allow sensationalism to cloud the real facts. There was a recent article where someone had left a comment that said “I called the bee-keepers to remove a bee-hive from my house and they said it would cost $150.” The reader then goes on to say that she went to the store got a bottle of insecticide and sprayed the bee-hive down herself for all of $10. You can certainly go that route but wouldn’t that be killing off precious bees that could either be returned to the wild to keep propagating or delivered to bee-farmers who use it for they livelihood ? Secondly getting the bee-hive professionally removed will ensure that both the bees and honey and all of the honey comb are removed safely from your home. You could very well take care of the bees using an insecticide but if the honey remains and say the bees made their hive on your roof, you will be calling the roof guy in the next few months and trust me, at that point, you will wish you had called a professional bee removal service. Moreover, honey combs that are not properly removed have a strong and distinctive smell which will attract more bees for years to come. Do you see why it is worth it for you to take care of the problem once and for all ? I am in no way saying that colony collapse is not real or that declining species of honey bees should be taken for granted. That is why D-TEK Live Bee Removal exists. We don’t use pesticides in our bee removal process because we are passionate about environmental conservation. On the other hand, we are a business and there are things we need to pay for in our business and in our personal lives. So the next time you call up a bee removal service don’t assume it is all free simply because “honey bees are going extinct”.